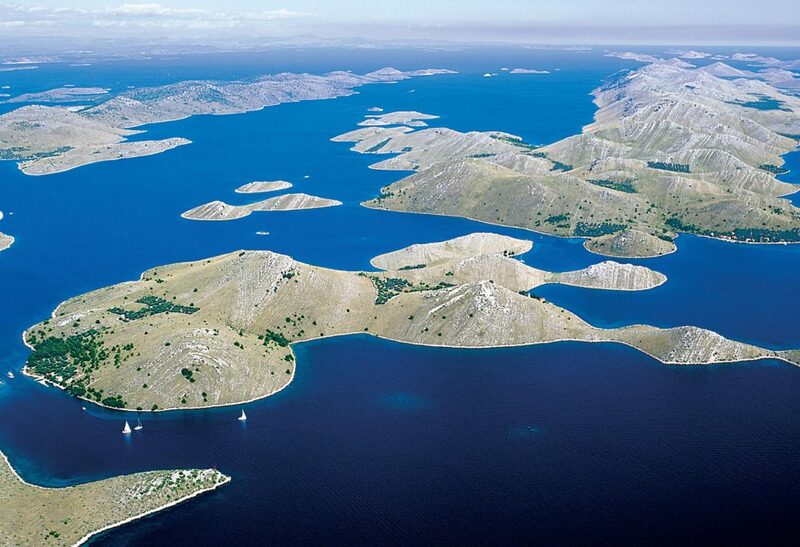 With 13 hours of sunshine a day in July and August, Croatia is one of the sunniest countries in Europe. Considering how little sunshine we get here in the UK, it’s easy to see why Croatia is fast becoming a tourist hot-spot. One of the top reasons to visit Croatia is the sheer number of places you can visit in one trip. All of the major coastal towns and cities have ports where you can head out on organised boat trips or ferries to discover even more of this incredible country. With spectacular beaches on its many exotic islands and plenty of unforgettable architecture in the major cities like Pula, Split or Dubrovnik, you’ll find it hard to choose just one day-trip (and you don’t have to!). You can even catch ferries to other countries such as Italy and Slovenia. Add to all of that delicious local cuisine and beautiful undisturbed countryside, we can’t believe you haven’t already booked your Croatian getaway. You might already be familiar with Polari, Bi Village and Lanterna which were new campsites to Canvas Holidays in 2016, and now we have even more on the Northern coast of Croatia. Istria has a strong Italian influence which is obvious in both its cuisine and architecture – Pula’s Roman Ampitheatre is the only remaining Roman arena with four side towers preserved. Pula is also the nearest airport to all of our Istrian campsites. If you want to get back in touch with nature, Park Umag is the campsite for you. Hours can be spent exploring the onsite eco-park and discovering the many indigenous plants. There is direct access to a Blue Flag pebbled beach where you can relax in the sunshine. If you like a more active holiday, there are a variety of water sports available. A cycle along the seafront is the best way to take in the stunning views of the coast. For those looking to get away from it all and just relax, head to Bijela Uvala. The campsite is surrounded by peaceful pine forests and the soothing sounds of the nearby waves. 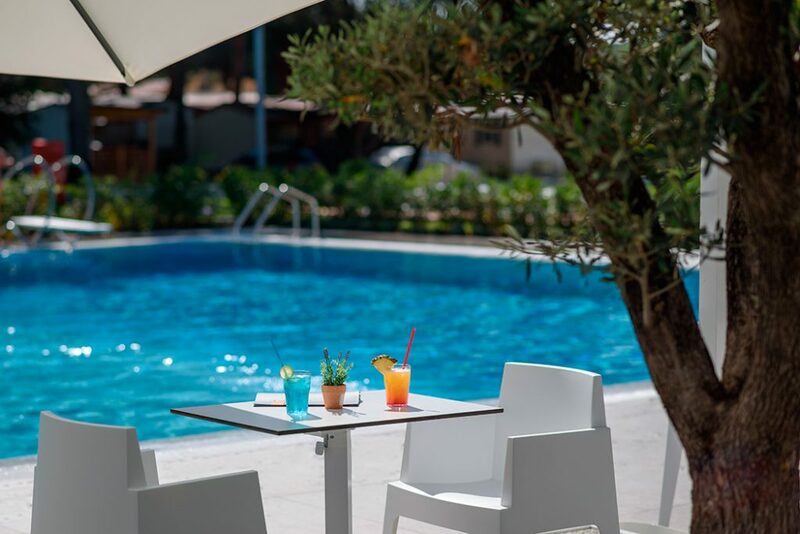 You can spend your days lazing by the poolside and nights with a drink in hand at the beach bar. Head to the massage studio to really unwind while the kids take advantage of the site-run children’s club. 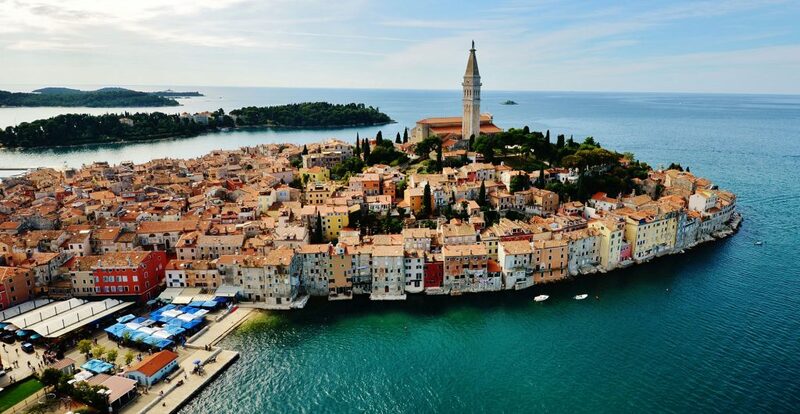 A day-trip to the historic city of Poreč is a must to really experience the local culture. Camping Valkanela is another great campsite set in a peaceful location, but still not too far from some great towns. Located on a peaceful cove with direct access to a Blue Flag beach, head to this campsite if you love spending your holiday soaking up the sun. In addition to the beach front, there is a spacious sundeck by the pool complete with drink and snack bars. Rovinj is a short drive away from this campsite where you can catch the ferry to Pula. Not only do we have new campsites, some of them are in a brand new location! The Dalmatian coast has some completely breath-taking views with majestic mountains towering above the sparkling waters of the Adriatic. There are stunning National Parks to visit and islands to hop around. Fans of the TV show Game of Thrones will recognise this region from the show as both Dubrovnik and Split are filming locations. Most of our campsites are located near Zadar and Split, which both have airports with flights available to and from the UK. 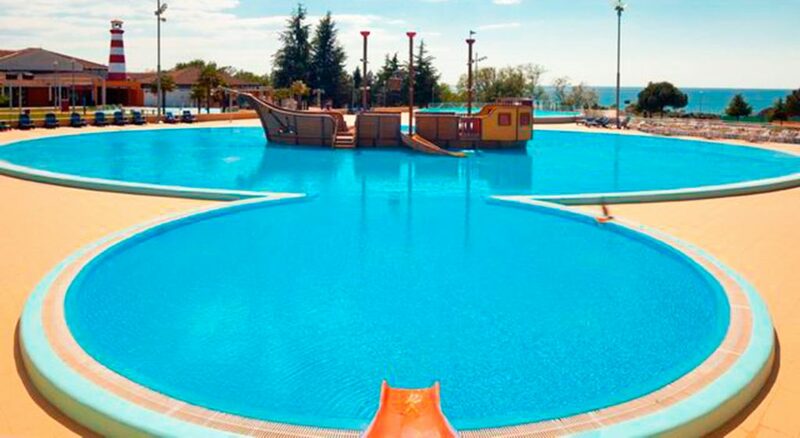 Camping Zaton is ideal for families as it has a great pool complex, including a range of shallow pools for younger children. The pool overlooks the stunning sand and pebbled beach below. There are a number of bars and restaurants along the long stretch of beach, so you can enjoy dining out on warm summer evenings. This campsite is big on entertainment with a programme of shows and live music showcasing local Dalmatian festivities. 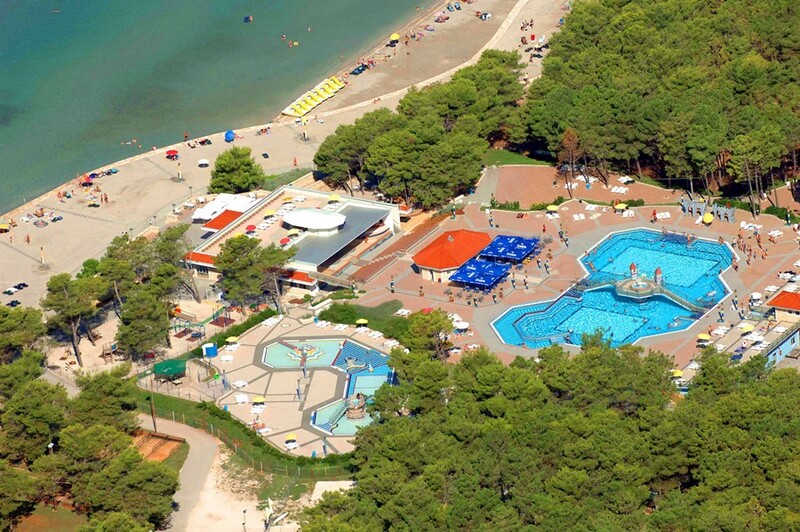 Camping Solaris is a huge, lively resort with plenty to do on site. If you don’t plan on spending much time away from your campsite, this is the destination for you. There are three pools with a glamorous beachside bar, a wellness centre and even a Pirates Adventure Mini Golf course. If you’re a family with teenagers, the Solaris Beach Legend Club features a disco shaped like a pirate ship. A must-visit is the campsite’s water park featuring six water slides and a lazy river. Camping Vranjica Belvedere is the ideal campsite for couples to relax and enjoy some time together. There are plenty of onsite food and drink options including a restaurant serving up authentic Dalmatian specialties and a healthy juice bar. 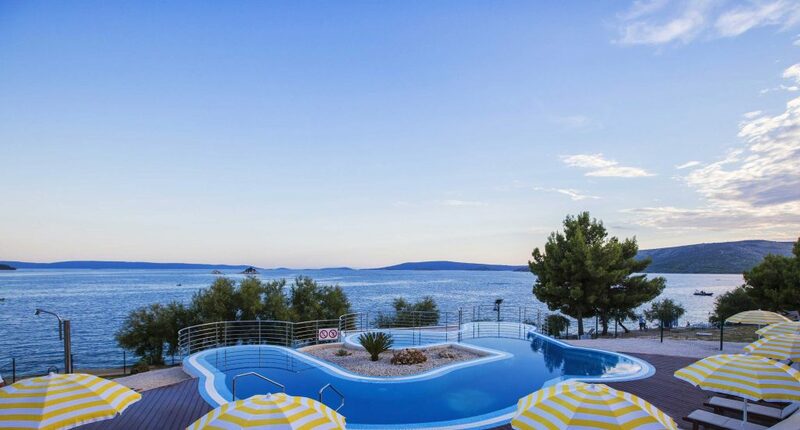 The pool overlooks stunning views of the beach and turquoise Adriatic water. It is especially impressive at night when the pool lights up in a variety of changing colours.